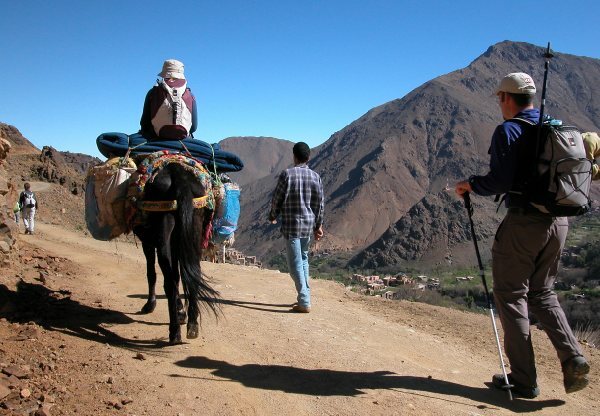 Morocco is a wonderful place for lovers of hiking and trekking. 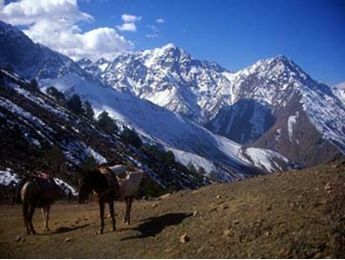 You will enjoy entire days of walking in the High Atlas and camping in the villages or in night shelters. During your daily walks, you will appreciate the contact with the locals and the wealth of our mountains. High Atlas is one of the most beautiful physical features in Morocco. Riding strong, streaking across the country from the South West to North east, the High Atlas is one of the greatest mountains of the world, the ideal place for hiking in Morocco. Sharp peaks, deep valleys, high plateau create a lovely landscape. It is an ideal place to relax away from the city and enjoy the picturesque scenary. Parallel to the Atlantic shores is the Anti-atlas agadir close to 2,000m which offers a stunning scenary and ruins of ancient granite landforms. The feature consists of massive piles of balls stacked, covered with original vegetation: Cactus, almond trees, Oleanders. The beautiful rock formation, incredible blue rocksand the agadir (castles) are a sight to behold. The Middle Atlas displays a spectacularly beautiful range of mountains carpeted in green with cedar and Oak trees. the small town of Ifrane is used as a tourist destination in summer due to its mild temperatures. The forest skirts the the desolate highlands and barley crops adapt themselves perfectly to the nearby lakes. The Oleander form a guard of honour for the river Oumer rbia (commonly referred to as mother of springs) which joins with the 40 sources. Whether you are a regular or occasional visitor, we help you live your dream of Trekking in the Moroccan Atlas on just a few tours.